The upper floor offers surprising views onto the museum and exhibition architecture. 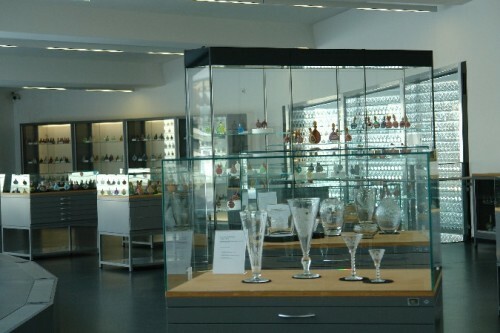 In addition it hosts several additional exhibition areas; at its centre the study collection, which displays outstanding works of glass art and collections of the Glass Museum to the public. One highlight, amongst others, is the unique Udo Dammert collection providing an amazing world tour through the universe of reverse glass painting from Spain to China. Regular exchange of objects from the study collections and from storage is envisaged on this floor as is the display of recent acquisitions.